The tattooing process is no mystery. 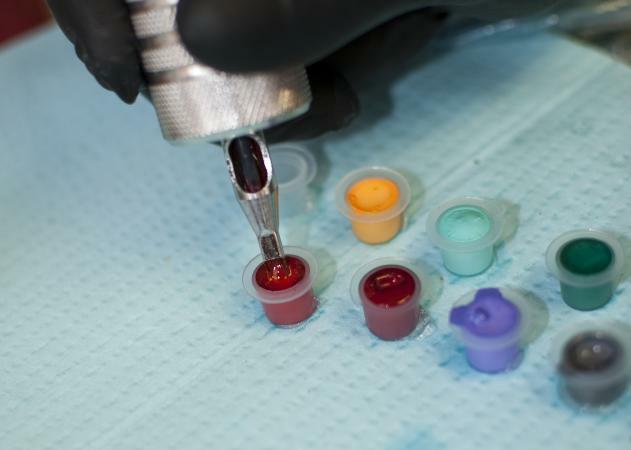 At its simplest, it's just the insertion of small amounts of ink into the skin, using a sharp tool like a needle. Skill is involved in what tools are used, how the ink is placed, and how the design is drawn. Understanding the steps can help put your mind at ease if you're considering one or are getting one for the first time. The first step in the tattooing process is the selection of a design. Most tattoo shops will have pre-drawn pictures, also called "flash," that you can choose from, if you don't mind having a design that you'll also see on other people. These typically line the walls of the shops and books and there are a multitude of styles, including skulls, flowers, tribal, arm/ankle bands, lettering, kanji and more. You can also find "flash" online. Some pictures are available for free to download or for sale. If you want something original, talk to the tattoo artist about creating a unique image. This can be based on something you or a friend has drawn or on a favorite poster or painting. In many instances, if you talk to the artist beforehand and bring in images of the style and type of tattoo you are looking for, he or she can create something based on your examples. 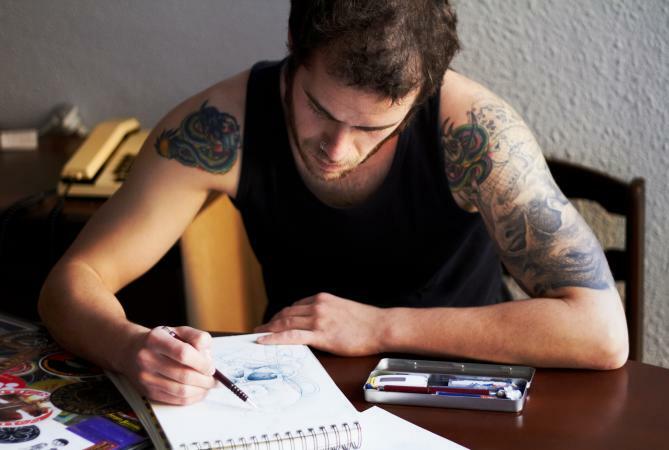 You may need to shop around a little since not all tattoo artists will be interested in or able to do an original design. Of the many who can, not all will share your vision or have a style you like. Try visiting local shops' websites, or ask people with tats you admire where they got them done. This step can come into play before or after choosing your design, but the placement of the tattoo is important. Take into consideration that some designs fit better in certain places. For example, a larger tattoo with intricate details will require more space than is allowed on your wrist or along your ankle; whereas a small design just hanging out in the middle of your chest or back could look out of place, especially if it is your first tattoo. You also have to think about the lines of the tattoo and how they will fill the space. For example, if you choose a long piece of tribal designed for an armband, it might look a bit funny if you tattoo it down the side of your calf. If you are looking at a smaller design like a rose or a heart, you might want to consider areas like your wrist, ankle, calf, bicep, or forearm, to name a few. However, if you are looking at a larger piece, you might want to choose a larger area with more exposed skin like the chest, shoulders, back, lower stomach or top of the thigh. Another thing to consider when thinking about placement is: Will the area stretch? A butterfly or pistol might look exceptional on your lower stomach now, but if you gain or lose weight, it will affect the quality of the image. In some instances, they can get distorted. If you are worried about this aspect, your calf, shoulder blades, base of your spine, and forearms are great places to get a tat. Before you allow anyone to touch your skin with a needle, make sure you're in a safe, clean place. The shop should be equipped with sterilization equipment, including an autoclave. The artist should use new needles and fresh inks for each customer and should wear gloves, again using a new pair for each new person. You should also look for American Red Cross certification or to ensure that the shop complies with OSHA requirements. If the shop doesn't seem clean or the staff won't tell you what they do to keep customers safe, go elsewhere. Once you've chosen your design and talked with the artist, he or she will typically make a ditto or an outline for your skin, unless the person is free handing the design. The artist will then prepare the inks and equipment for your design. When everything is ready, he or she will lead you to a chair or the artist's station, put on fresh gloves, and prepare your skin. The area will need to be cleaned and sterilized. If the area is hairy, it may need to be shaved. When the skin is ready, the tattooist will place an outline of the picture on your skin. This is usually done using special papers and inks that work sort of like temporary tattoos. You'll have the chance to approve the placement of the design before any permanent work is done. When you're comfortable with how the tattoo is placed, the tattooist will pull the skin taunt and begin inking the design into your skin. A tattoo machine uses tiny needles to place the ink just below the skin's surface. The needles move rapidly up and down, a little like a sewing machine. The artist guides the needles to create fine or bold lines, shadows, and/or blocks of color. Usually, he or she will begin by outlining the picture in black ink, and then will fill in the outline with colors and/or shading. The artist may switch needle types during the tattooing process, depending on the need for fine lines, fill, or shading. Inking takes anywhere from a couple of hours to several days of sessions, depending on the size and complexity of the design. For example, a small design like a piece of tribal in black or a small black and grey flower could take as little as 20 minutes. However, a larger piece or those with full color and details can take an hour to several hours, depending on the complexity. Large sleeves or chest pieces with intricate details can take hours to several sessions to complete. Additionally, most tattoos can also require touch up sessions after the initial healing process. Tattoos hurt. 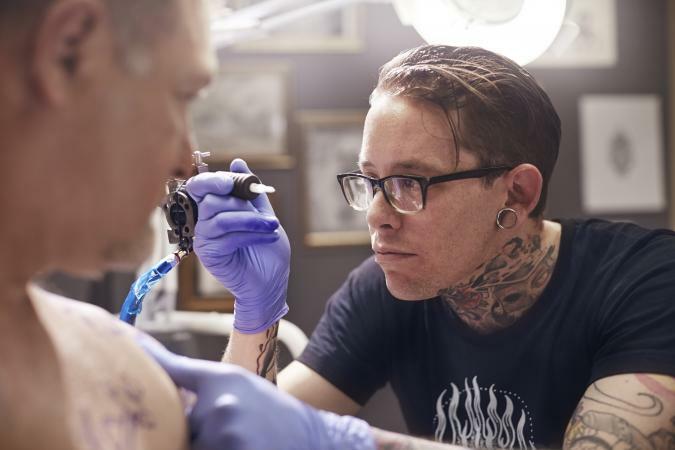 There's no getting around it: the tattooing process involves needles which prick the skin hundreds of times as the ink is placed. Some people find tattooing just a little uncomfortable, while others have to grit their teeth against the pain. It depends on your own personal pain threshold, on the location of the tattoo, and on the style. Some people say the outline hurts the most; others find that the pain builds over time, so that the coloring is the hardest part. 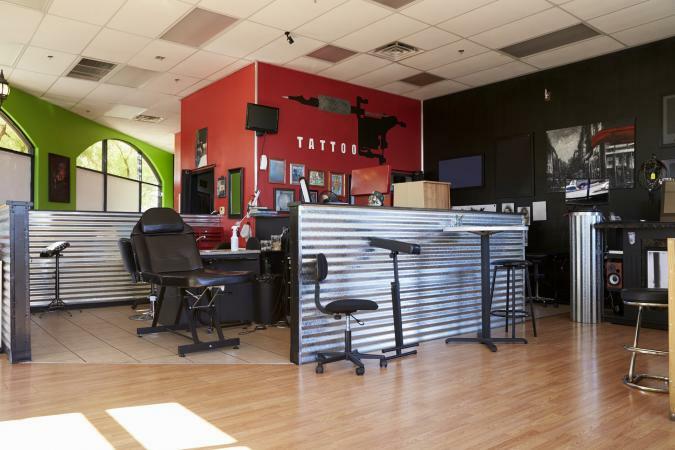 It's okay to ask for a break any time during the tattooing process. Your artist would rather give you a chance to rest than have to pick you up off the floor after you faint! A good artist will be used to different people's reactions and should be patient with you. It's normal for the area around the tattoo to look a little red when the tattooing process is done. It's also okay to see a little blood, although bleeding should stop fairly quickly. Your tattooist should clean the area gently and then place a bandage over your new tattoo. He or she will give you information on appropriate aftercare. The artist will probably instruct you to use ointment on the area for a few days and then switch to lotion, to stay out of the sun, and to be alert for signs of infection. Some artists prefer certain products or have personalized regimens for aftercare. Getting a new tattoo can be a trying process, especially if it is your first. But it isn't as ominous a process as you think if you simply break it down into steps. Once you find your design and decide where you want to place it, then you simply need to find a shop that can meet your needs. The rest is simply steady breathing and remembering that the pain will only last a short time - while your new ink will last a lifetime.